I'm a talker. Especially when I'm really excited about something. And building a successful lifestyle photography business is one of those things I'm really excited about. All the time. I'd love to help you with your photography business. Go ahead -- ask me anything. Freezing the Moment: Capturing spontaneous moments and cultivated natural interactions, and finding a balance between the two. Prepping Clients: Helping clients feel compltely prepared so they can relax and enjoy the session. Making it Easy: Helping busy people get from the desire to freeze their memories to enjoying their story in tangible form. Mentoring starts at $150 per hour, with package discounts available for three hours or more. These are just suggestions, of course -- let's chat about your needs. Start the process by clicking below. These are just suggestions, of course -- let's chat about your needs.
" (Jaye and I) are working together to get me over a couple of hurdles that I am experiencing in setting up my own business...what a Godsend. 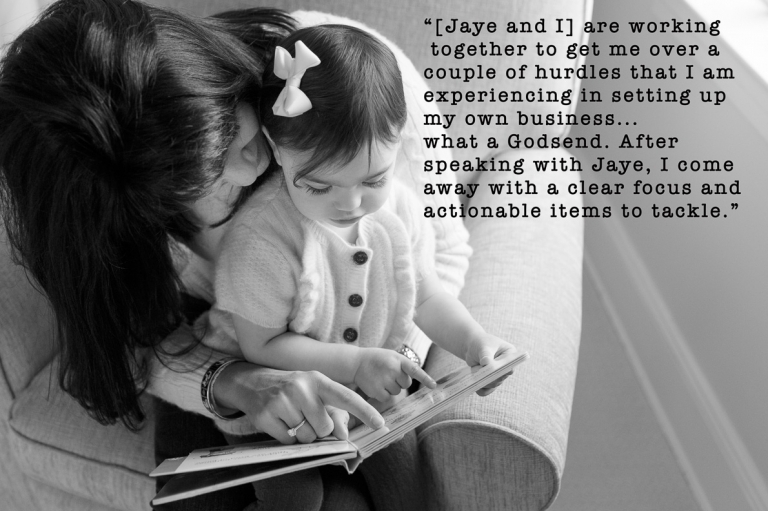 After speaking with Jaye, I came away with a clear focus and actionable items to tackle." I’m a talker. Especially when I’m really excited about something. Photography — and building and running a photography business — are things I’m really excited about. All the time. I’d love to talk to you about your struggles and aspirations as a photographer in business. Go ahead — ask me anything. Prepping Clients: Helping clients feel completely prepared so that they can relax and enjoy the session. These are just suggestions, of course — let’s chat about your needs. Start the process by clicking below.